The inflationary practice of disclosing personal information both professionally and privately, e.g. in interviews, castings, confessions and psychoanalysis, also has a structural influence on the way in which people present themselves publicly, and the range of formats available for such presentations. But how can one use this speech to dismantle, exaggerate or exhibit the concept of a confident speaking position? What kind of connections could be drawn, or rejected, between aesthetic production and personal experience? In her new artist book "Return to Inquiry" (2012) Karolin Meunier assembles corresponding scenes from art and theory and proposes a model of confession as cultural technique. 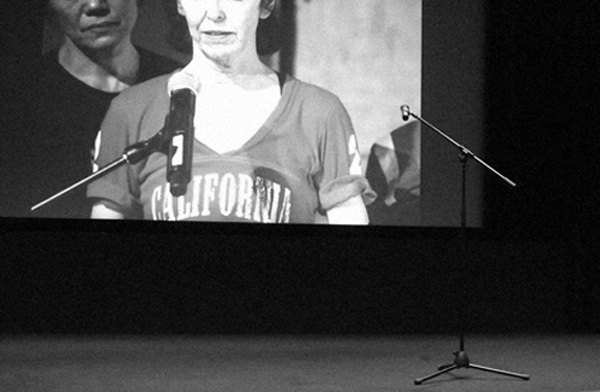 The evening at Temporary Gallery is part of a series of events, in which different aspects of the book are translated into a lecture or performance situation. #3: Character will focus on the relation between person and acting, taking examples from Andrea Fraser and an interview film by Delphine Seyrig. Karolin Meunier is an artist and writer living in Berlin. Her videos, texts and performances focus on standardised and mediatised conditions of communication. She is currently member of the feminist film distributor Cinenova in London and of the publisher b_books in Berlin. Ilka Becker is a professor and researcher at the Department of Aesthetics and Art History and at the Postgraduate Programme "The Photographic Dispositive" at HBK Braunschweig University of Art.